Have a question for Eden Plaza Danang? "The pool is nice and clean." "Nice 1 night stay at reasonable price." Ideal for fun and relaxation, Eden Plaza Danang is located in the Hai Chau area of Da Nang. The hotel is not too far from the city center: just 2.00 Km away, and it normally takes about 5 minutes to reach the airport. For sightseeing options and local attractions, one need not look far as the hotel enjoys close proximity to Tulip Brewery, Ho Chi Minh Museum, Danang Bazaar. At Eden Plaza Danang, the excellent service and superior facilities make for an unforgettable stay. For the comfort and convenience of guests, the hotel offers free Wi-Fi in all rooms, 24-hour security, gift/souvenir shop, postal service, taxi service. All guest accommodations feature thoughtful amenities to ensure an unparalleled sense of comfort. The hotel's hot tub, fitness center, sauna, outdoor pool, spa are ideal places to relax and unwind after a busy day. When you are looking for comfortable and convenient accommodations in Da Nang, make Eden Plaza Danang your home away from home. "Good customer service can account for a healthy portion of t..."
Nice 4 star hotel. However lots of group tours from korea and china. They leave around 8am to 9 am then all yours .Breakfast buffet is o.k no complains. Outside swimming pool is also o.k.big enough. 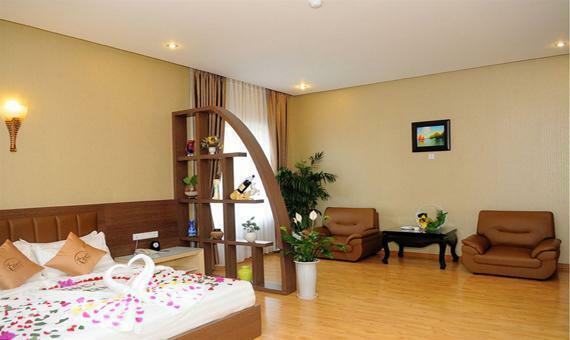 Close to airport,Han market and city attractions. I stayed in apartment type room with my family. 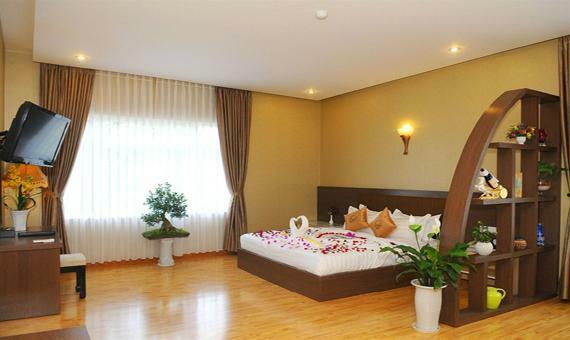 The room is very spacious and clean. But most of the staff couldn't speak English well. In addition, the breakfast is not good, especially for younger kids. The staff at Eden Plaza were excellent from the moment I arrived, Hoa (apologies if I have got that wrong) on the desk was superb. He went out of his way to order me suitable food from outside the hotel (I was preparing for a race the next day), ordered me a taxi for 3 in the morning which was there! All the other staff also went beyond what I would expect and have experienced in similar level hotels. The facilities were good (pool, gym, etc) and the room (deluxe double) was spacious and clean. I will happily stay there when I return to Danang. I've found quite good hotel with very helpful and friendly staff. It has big enough swimming pool. Maybe location of the hotel is not perfect but enough to easily reach airport, beach or city center in less than 10 minutes by motorbike or taxi. Good. It is not far away from the airport. The neighour of the hotel looks like some department related with army or weapons, and I found it quite interesting. With several minutes of walk, you can get to the bridge. Staff performance, good food, convenient location. It was an enjoyable stay. There's not much to do in the immediate surrounding of the hotel but it is only a short taxi ride to the main attractions, shopping and night-life. I rate the staff very highly. The airport is only a short distance away. It was a nice stay with my family. The room is not very big but acceptable. The swimming pool is nice, but sometime very crowded which makes a feeling that water is not clean. The hotel internal view is nice. Booked this hotel to be near the airport. It was twice as expensive than another hotel we stayed in downtown, but really not at all any better- though flashier. It's near to the airport, but it was difficult to find anywhere to eat in the neighbourhood and they did not speak english. We asked the hotel in advance to have rooms near each other so we could be close to the kids. This was the only hotel that did not manage that. We were thankfully on the same floor, but quite far away. As Danang is so small, I will book a place in downtown even for the last night if we come back. The rooms are big. A lot of gold and flashy furniture! Dear Aurelia, We're very grateful for your sincere feedback about hotel service that we would need to figure out and innovate. We are apologized for inconvenience cause your stay. Some designs and decoration at the hotel made you confused. Ocene again, thank you so much for having let us know and we do look forward to your return that we seize the chance to serve you much better. Best regards, Board of Hotel Management. Low end 4 star Hotel, clean, but tatty. Very good value if you are on a tight budget. The main problem is that many people are allowed to smoke in the no smoking rooms, alleyways and lifts etc. Rooms and bathroom are large and quite nice. Karaoke is VERY LOUD, the room pounds with the noise and I mean really loud! Luckily it stopped before bed time. good location for the airport, but not so good if you want to be near the beach or town center. Front desk staff are great, but the massage and bar staff are less interested. I arrived at da nang one day before the next tour grup appointment. Next day afternoon. My flight landed at 21.30. So i"need spent for one night. Eden is very near from airport. The hotel very clean, enough breakfast. Free foot massage. All are ok. Thanks. The hotel is near the airport. This is good if you are staying overnight and have to leave for the airport the next day. The breakfast is alright. All other aspects were disappointing. The air-conditioning was poor. The hotel old and in need of a refurbishment. Some renovation was going on but it only added to the desolation of the hotel. It is located far from the city centre. The only attraction is the military museum next door which appeared deserted. When I was in the room in the evening, a strange man try to get into my room, luckily I locked the inside locked so he couldn't. I called the hotel. The front desk said the man said he is my friend so they just gave him the room key without checking anything. It's very scary and i couldn't sleep that night. I check out the next day. Very friendly and helpful staff, we used English and Chinese to communicate and they had staff fluent in both. Great for the children but the "kiddies play area" was set up in a remote and dingy location on a stone floor, so not really suitable. My son and I stayed here for 9 nights which is quite long. rooms are nice, pretty new and you have all you need. Housekeeping could do a bit of a better job but if you call them, they are all willing to help and accommodate. Breakfast was good with every day some different food. More asian choices than western but still enough of both and really a lot to choose from. the location is ok but not in the center, even though in 10 min. walk you reach one of the markets. to go to the beach, it's about 10 min. taxi ride or the hotel helps you to book a scooter. It is an advice to possibly not book when the domestic market has holidays because it will be full (that is what happened to us) but otherwise it is a good hotel for what you pay. There is a pool which is fine as well and they are upgrading a few things, such spa and other restaurants. an ATM machine just outside the hotel. Eden plaza is a huge hotel with great management and staff. The room was clean and comfortable. The bad part was only that hotel is under construction so we woke up really early because of the noise. Nevertheless I would recommend the hotel. It is located near to the airport. We thoroughly enjoyed our stay. The staff was very helpful in looking after our interests in advising about and engaging an out-of-town taxi transport, as well as in sorting out issues with the taxi driver. On a late Sunday evening, they helped us in clearing some cofusion regarding our airline booking for a Monday morning flight. They treated us like their own guests and provided very efficient service in looking after all our needs. We were very pleased with the whole experience and would highly recommend this place.